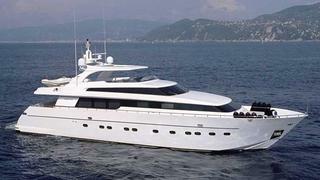 News in overnight from Cromwell Littlejohn and John Cohen at Merle Wood & Associates as they're appointed joint central agents for the sale of the 32.8m motor yacht Petrus. Petrus was built by Italy's Sanlorenzo yard in 2007 to RINA class. This superyacht's interior by Della Role offers flexible accommodation for up to eight guests in a master, VIP and twin cabin along with a sofa bed in the main deck media room. Twin MTU 2400hp engines give her a maximum speed of 27 knots and a cruising speed of 23 knots. Available to view in South Florida, Petrus is on the market asking $9.5 million.